You might already knew or tried the similar dish like this, but to those who yet to try, or not confident enough to try out even though you know how to do it, (hey hey) I am here to give you a ‘helping hand’ and mental support… ?! Simple dish, very simple dish, but you have to have a conventional hotplate (those hotplates served in the restaurants or local hawker ‘Zi Char’ stores), if not the Happy Call non-stick pan, to have this dish done ‘professionally’. To improvise this conventional egg tofu hotplate dish a little, I did add the assorted mushrooms. 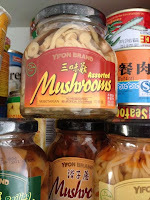 It is also to show you how I use the Yifon brand bottled instant mushrooms which are easily available off the shelves. 1) Dust the egg tofu slice lightly with corn flour (Simply pinch some corn flour with clean and dry finger tips to sprinkle on the tofu for the dusting). Then, deep fry the egg tofu slices (which yields better browning effect and typically tastier). Or, minimise the usage of oil by swallow frying it with a deep frying pan (or Happy Call double pan, if you have one, too), with medium heat. I used my Happy Call Pan where it has its sealing lid to prevent oil splashing, and still not worried about burning the food. When one side of the tofu is done with the browning, either flip the whole pan around (without opening its sealing lid) to brown another side of the tofu (as the sealing lid will prevent oil leakage), or open the lid, and flip the tofu over one by one. When both sides are done with the browning, drain excess oil (if any). 2) Add in assorted mushrooms. Then, add the listed sauce ingredients, and stir fry gently to combine well. Thicken the sauce slightly with corn starch slurry (a pinch of corn starch mixed with a teaspoon of water). Transfer the ingredients out into a dish for later. 3) Now, pour the beaten egg into the emptied pan and cook until medium well. 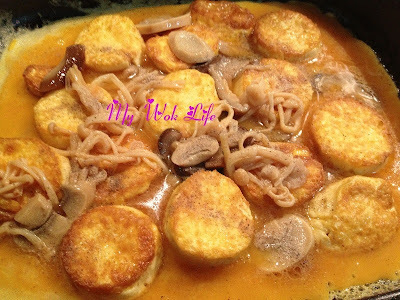 Return the tofu and mushrooms (together with the thickened sauce) and top them on the semi-cooked egg. Cook the ingredients altogether until the egg appears almost well done (with sauce visibly seen on the egg bed). Heat off. Transfer the dish onto a large plate to serve. This can be easily done without destroying the beautiful presentation of the dish as the surface of the Happy Call pan should be smooth and completely non-stick. To add colours onto your dish presentation, garnish with chopped corriander, spring onion and even red chilis, serve immediately. 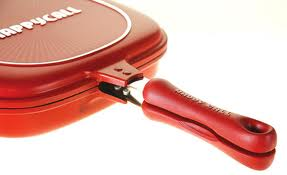 If you are using conventional hotplate, heat up the hotplate with high heat, till blazing hot. Then, reduce heat to medium fire. Add minimal amount of cooking oil and beaten egg. Cook the egg till semi cooked before transferring the tofu and mushroom (together with the thickened sauce) into the same hotplate, top them on the semi-cooked egg. Continue cooking the ingredients for about a minute before heat off. Garnish and serve together with the hotplate. In fact, I cooked a similar dish (See recipe) before. You may actually adapt the previous dish using this HappyCall pan, too. Tofu, mushrooms and egg are low in fat and calories. With minimal amount of oil since I cooked them with my latest kitchen tool, Happy Call Pan, the amount of calories intake, is thus, reduced, too. In my recipe, a serving of the dish counts about 140kcal. Tips: You may either follow exactly the steps listed. Or, be more hardworking. Cook the sauce separately and top the thicken sauce onto the done dish, at final stage. This way, you will serve the dish with firmer (drier) egg bed with more gravy on top of the tofu and mushrooms, instead of having a more runny/ watery mouth feel in the overall dish. * Both the assorted mushrooms from the instant bottled types and freshly cut, are fine.